I was told it came from the 1930's. I picked it up off of Craigslist. It is in excellent shape and runs very well. The stand was made by the original owner out of oak. It was a great find for the price. The owner even threw in a complete set of tools with it. I got the Delta "home" shop tools from my mother-in-law after my father-inilaw passed away. She told me the father-in-law purchased tools from a widow in the Dallas area. 48" long lathe bed with assorted parts, a gaggle of turning tools Delta #121 thru 128, plus a few Craftsman. I am missing the 'dead' end. I would like to know the required motor HP,RPM. I too am looking for info regarding mine. The tag on mine reads Homecraft Delta Serial#74 cannot find any Model#. 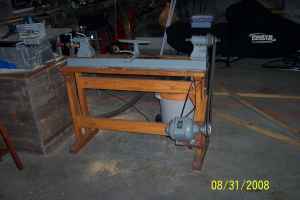 The lathe has the original cast Iron stand as showned on the Delta 11" Wood Lathe No. 930 pictuured on this web site. I too am experimenting with my lathe. I have the same lathe and it's a great tool. My dad bought it new close to 60 years ago and it still runs fine. Good luck with yours! I just picked one up off craigs list that looks nearly the same. The name on mine says Rockwell Homecraft by Delta MFG. I'd be interested to see what you find out about yours. Join in and write your own page! It's easy to do. How? Simply click here to return to Vintage Delta Lathes.